Languages: Tibeto – Burman family, English is the official language. Nagalim is situated between China, India and Myanmar, occupying an area of 120,000 km². The region’s climate is generally warm, with high levels of humidity and a significant amount of rainfall from May to September. The landscape is predominantly mountainous, which is why many villages are located on the top of steep hills – from there, it was easier for the Nagas to protect themselves against intruders and to defend their villages. 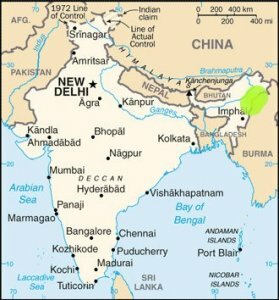 The part of Nagaland ruled by India consists of the territory which today is administered by four different administrative units – the states of Assam, Arunachal Pradesh, Manipur and Nagaland. The eastern part of Nagalim, ruled by Myanmar has been placed under two administrative units, those of the Kachin state and of the Sagaing division. The Nagas form several tribes, mainly established in the North Eastern region of India and north-western Myanmar and accounting for a population of over two million. Traditionally, the Nagas live in villages and clans, each speaking its own dialect. However, commercial towns have been rapidly growing in the region, bringing changes to the way of life and the social organisation of the Naga people. Naga tribal philosophies, expressed in folk tales, dances and music, carry lessons of ethical living for the Nagas. Every individual is expected to celebrate life by taking part to the singings and dance ceremonies. Naga traditions are permeated by the idea of heritage as the Nagas are taught to respect and preserve the wisdom and knowledge acquired from past generations. Every generation is expected to pass on to the next generation the knowledge necessary to ensure the survival of their culture. Due to the exploitaiton of the mineral resources of Nagalim by colonial entrepreneurs, the ecological balance of the once rich lands has been severly harmed. Besides, environmental degradation deprives the Nagas from maintaining a sustainable and respectful relation with nature that is characteristic to their culture and traditions. The Nagas are bound to nature through their most basic values, which permeate their traditional social, economic and religious practices. The contamination and increasing shortage of resources in the region therefore represent a violation of the Nagas' indigenous rights. Nagalim is represented at UNPO by the National Socialist Council of Nagalim (NSCN(IM)). The NSCN was created in 1980 by Mr Isak Chishi Swu and Mr Th. Muivah. Representatives of the NSCN attended various international meetings, visited numerous countries and, after resisting years of military attacks, engaged in negotiations with India’s central Government in the 1990s, representing the interests of the Naga. On 23 January 1993, the NSCN was admitted to the UNPO. The organization is still engaged in negotiations with the Indian Government, having reached a historic pre-agreement in 2015. In August 2017, the organisation affirmed that the parties were close to a final agreement. In 2012, in a joint communique signed by Mr Muivah and a representative of the Government of India, the Indian Government recognised the unique character of the Nagas' history and situation. After elaborating a proposal of a special federal agreement in which the Nagas would govern themselves, the NSCN(IM) accused India of deliberately delaying the talks in 2014. Subsequently, the parties reached a historical 33-point pre-agreement, which came to be known as the "Framework Agreement" and through which the Indian government declared that it "recognises the unique history, the identity, the sovereignty, the territories of the Nagas. It also recognises the legitimate right of the Nagas to the integration of all Naga terriroties". On 14 August 2017, the NSCN(IM) revealed that the negotiation was close to being completed. In addition to the exploitation of the mineral resources of Nagalim by colonial entrepreneurs, which has harmed the balance of the region's environment, irresponsible practices of exploitation continue to impats the living conditions of the Naga people. Mining activities in the region promote intensive deforestation and the exposition of rocks and minerals have culminated in the release of toxic gases into the athmosphere, contributing to climate change. Furthermore, the region has been suffering from loss of soil fertility and water contamination. Finally, environmental degradation deprives the Nagas from maintaining a sustainable and respectful relation with nature that is characteristic to their culture and traditions. The contamination and increasing shortage of resources in the region thus represent a violation of the Nagas' indigenous rights. Please download our Nagalim Member Brochure to learn more.